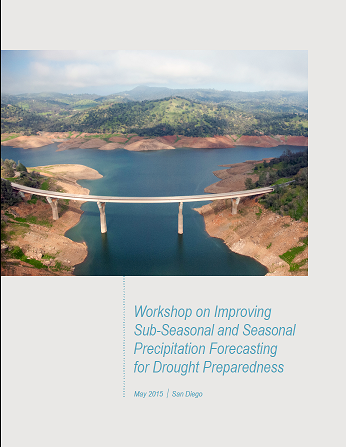 The Western States Water Council and the California Department of Water Resources cosponsored a workshop on precipitation forecasting held May 27-29, 2015 in San Diego, California. WORKSHOP PURPOSE: The purpose of the workshop was to develop a Western vision for improving precipitation forecasting at timescales beyond the two-week weather forecast time domain, loosely modeled after the Council’s vision for an observing network for Western extreme precipitation. Improved forecasts of precipitation at longer timescales can be used for many purposes, such as interstate compact or water rights administration, planning for local water agency supply deliveries, or flood season preparedness. Forecasting needs vary not only with the purpose of a forecast, but also with geographic location, because the seasonal pattern of storm activity and large storm types varies with location. Improved skill in precipitation forecasting can be achieved by improving prediction of large storm types, such as atmospheric rivers on the West Coast or the monsoon in the Southwest. A workshop summary report will be prepared, with the intent of using the report to inform a dialog with NOAA’s Climate Prediction Center on taking advantage of prediction skill that may be available at a regional (Western) scale to improve the outlooks now issued at a national scale. The workshop’s ultimate goal is to advance the Council’s position calling on the federal government to improve precipitation forecasting.